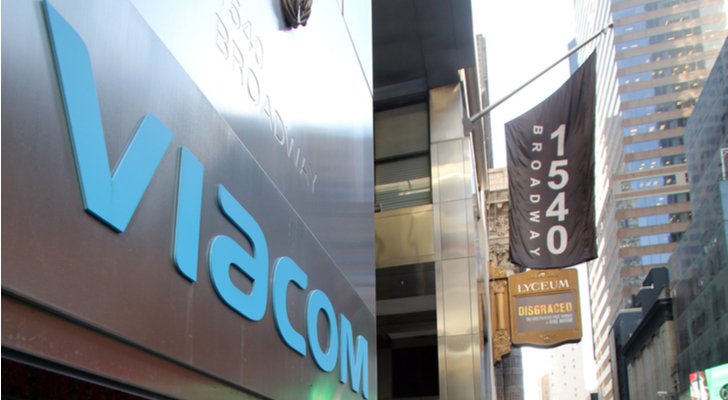 All those rumors regarding a potential remarriage of media companies Viacom, Inc. (NASDAQ:VIAB) and CBS Corporation (NYSE:CBS) turned out to be true. But, as always with M&A, the CBS-Viacom merger has hit a few roadblocks. CBS recently submitted a bid for Viacom. But the bid was below market value (0.55 shares of CBS stock, or roughly $29 per VIAB stock). Viacom stock, which had been propped up on these M&A rumors, fell sharply on the news from above $30 to right around the $29 takeover bid. As was largely expected, Viacom management rejected the offer outright. They are prepping a counter-offer which is rumored to fetch a price of 0.62 shares of CBS stock, or roughly $33 per VIAB stock. That would represent nearly 15% upside from current levels. What’s next in the CBS-Viacom merger saga? These two companies will merge, mostly because they need to merge to defend against rising internet-TV competition. The takeover price will likely be a premium to VIAB’s current stock price because, if nothing else, there are cost-saving synergies in this merger. The timing of the takeover should be soon because, again, this needs to happen soon. All in all, I don’t think it’s such a bad idea to own VIAB stock here and now. Here’s a deeper look. The entertainment industry is rapidly changing. Gone are the days of hefty cable bills and cords. Here are the days of over-the-top streaming platforms like Netflix, Inc. (NASDAQ:NFLX), Amazon.com, Inc. (NASDAQ:AMZN), Hulu and Alphabet Inc’s (NASDAQ:GOOGL) YouTube. The net result is huge growth in Netflix subscriber numbers at the expense of traditional cable viewership. Companies like CBS and Viacom are hurt when traditional cable viewership goes down because cable is the meat of their business model. But traditional media giants aren’t helpless against rising internet TV competitors. Indeed, many of them are starting to fight back. Just look at Walt Disney Co (NYSE:DIS). They just acquired a bunch of content assets from Twenty-First Century Fox Inc (NASDAQ:FOX) and are prepping an internet TV streaming platform that will launch in 2019 with a robust content portfolio that will rival Netflix’s large and growing content portfolio. Could Viacom do the same thing? Or CBS? Viacom has good content. So does CBS. But neither of them have a big enough content war-chest to rival Amazon, Netflix or even YouTube. Thus, the best path forward for Viacom and CBS is for these two companies to merge, create one big and formidable content war-chest, and launch an over-the-top streaming service. All in all, a CBS-Viacom merger will happen because it needs to happen. Also, considering this merger could be a life-saver and will undoubtedly offer massive cost-saving synergies, the final takeover price will likely be a premium to the first takeover price of $29. VIAB stock is currently trading at a single-digit forward earnings multiple, so there isn’t much immediate valuation risk if a deal doesn’t go through. Moreover, it’s trading below both its 50- and 200-day moving averages, meaning the stock is already depressed relative to historical prices. Overall, downside risk seems limited, but upside potential through a higher bid looks promising. Downside looks protected by an already depressed valuation and stock price. But a buyout offer is on the table, and the prospects a higher buyout offer look promising. Thus, the risk-reward on VIAB stock looks favorable at these levels. Article printed from InvestorPlace Media, https://investorplace.com/2018/04/cbs-viacom-merger-best-path-forward/.